I have been looking through our picture files which is voluminous because I use it to make visuals. There are pictures of Billy Ray doing all his tasks, etc. I found this one that is an example of adapting to what works for your child. Billy Ray loves western wear. Since we bought him his first “cowboy belt” with the skinny do-dads he is unwilling to wear anything else. When he gained a lot of weight due to the medication the belt no longer did its job at holding his pants up well. There were some embarrassing moments. We attempted to transition him to suspenders but he wasn’t having it. A part of adapting is to assess what will motivate your child to do the desired activity. In the case of the western belts what Billy Ray loves about them is the “shiney” things on them. 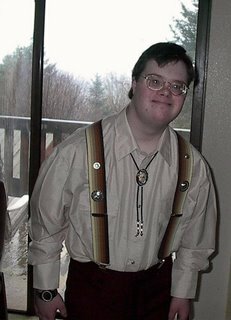 I called every western wear store I could find to try to find suspenders that might have the same ornaments as the western belts. Nothing could be found. Our local western store did carry trinkets that are generally put on saddles or vests. At last, we purchased a pair of plain suspenders and some of the trinkets. 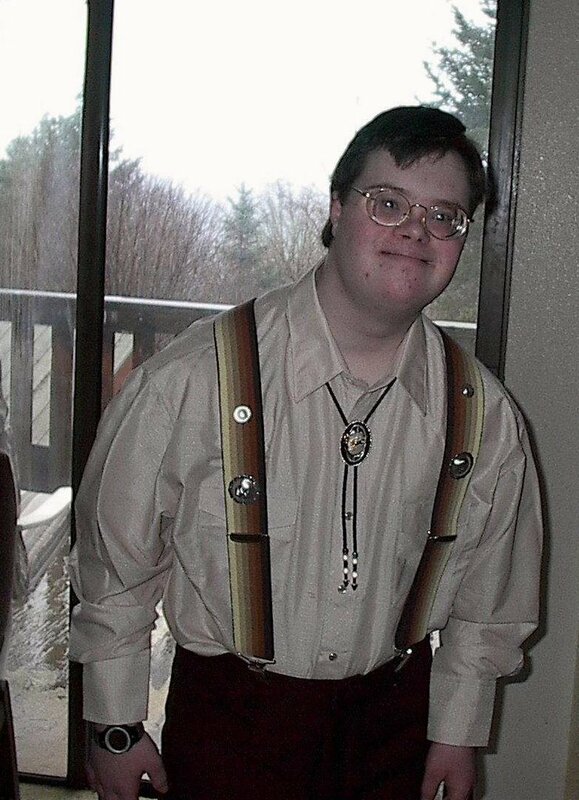 His first pair of suspenders with “shineys” is pictured here. Eventually we found the little ornaments in letters and were able to make him a pair of suspenders with his name on them which he loved. It was not a slam dunk to get him to transition even with the ornaments. He had to wear both belt and suspenders for a while. Another thing that helped was my husband noticed that in wedding pictures his son, Michael, was wearing suspenders. Billy Ray adores “Bubba Mike” so anything Mike does is okay for him to do. I made a visual with this picture of Billy Ray in his shiney suspenders and Mike in his suspenders. I wrote couple of lines about belts not always working so sometimes men need suspenders. I made a heading that Billy Ray and his Bubba wear suspender. Walla!! It worked wonderfully.